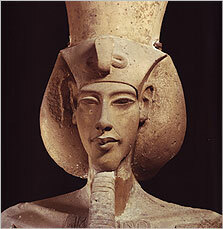 _Akhenaten was the first in the line of Cro-Magnon infiltrators in Egypt who attempted to wipe out all forms of Goddess worship and force everyone to worship a male God of the Sun disk only. What is clear is that he was Cro-Magnon, and not pure Neanderthal like Ramses. King Tut's blood type was A2 with antigen MN. A2 is a much rarer subgroup of A. It was once the sole provenance of European populations, having its highest frequency in the Scandinavian lands. This fits perfectly with him being half Neanderthal, a mixed Cro-Magnon. But our families knew what to do, they gained their trust and secretly worked their way back up through the military and as a High Priests of Amun (basically same thing as RC Church these days) and eventually regained power in the 19th Dynasty when Ramesses I gained back the title of King, his Father was Seti. He and his wife Queen Tia set about restoring the old ways. The 19th Dynasty were much loved and respected. Eventually though through war, corruption and infiltration the High Priests of Amun gained full control of the whole of Egypt, and the true spiritual royalty were forced to move on. The great era of Egypt was over, as Amun-Ra worship took over completely, and still does today in the form of the Roman Catholic Church & Freemasonry. While not regarded as a dynasty, the High Priests of Amun at Thebes were nevertheless of such power and influence that they were effectively the rulers of Upper Egypt from 1080 to c.943 BC, after this period their influence declined. By the time Herihor was proclaimed as the first ruling High Priest of Amun in 1080 BC--in the 19th Year of Ramesses XI—the Amun priesthood exercised an effective stranglehold on Egypt's economy. The Amun priests owned two-thirds of all the temple lands in Egypt and 90 percent of her ships plus many other resources. Consequently, the Amun priests were as powerful as Pharaoh, if not more so. One of the sons of the High Priest Pinedjem I - would eventually assume the throne and rule Egypt for almost half-a-decade as pharaoh Psusennes I - while the Theban High Priest Psusennes III - would take the throne as king Psusennes II--the final ruler of the 21st Dynasty.